I was told by a creditable source that Amazon is enhancing their Amazon wish list feature to allow you to “remember” a hidden wish list. As a mom of two wonderful children with two very different needs and wants, this new feature will significantly reduce my time, frustration and repetition. Every holiday or special occasion (e.g., birth present, baby shower, birthday, Christmas, just because, etc. ), I will not need to send an updated email with the kids’ “private” Shared Wish List URL to my family and friends of their (our) latest gift requests. I will simply be able to share the list and my family and friends who will be able to “remember” it. With this new feature, you will be able to “Share a link” with your friends and family and when they receive the link, they will be able to “Remember” it. Meaning a persistent link to this list will show up in their Wish List navigation for easy future access. For my family, this means that my husband will now be able to view C2 and Ace’s Amazon Wish List with minimal vulnerabilities at anytime and not constantly ask me to send the link because he is successfully managing his email or send the list to [insert name(s)]. In our case, my husband will no longer have to remind me several times to send the link because it is not my top priority and I will continuously forget. 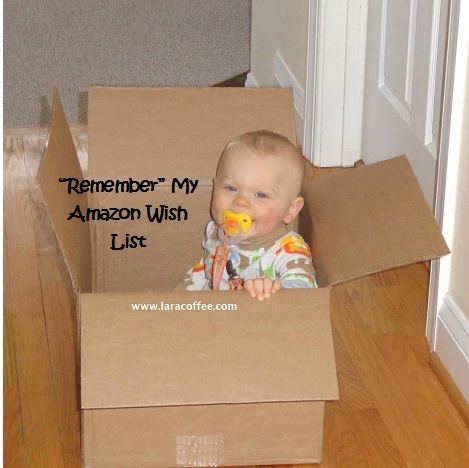 If you do not have an Amazon wish list for your child(ren), perhaps now is the time. Remember, creating a wish list for your child will make it easier for others to buy for your family. By having a wish list, it gives the sender an opportunity to get a gift both the parents and the child both agree upon instead of buying a gift that is a duplicate or something that is played with once and then is never touched again. Furthermore, even if someone decides not to buy off the wish list, the list will give your family and friends more insight to what your child’s needs, wants and perhaps clothing size in order to go buy a present elsewhere. Really, who can remember what size your niece and nephew are in now? Stay tune for the release of the new Amazon Wish list feature.